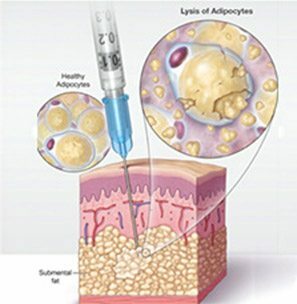 How does Kybella (deoxycholic acid) injection 10 mg/mL work? Sometimes serious side effects can occur, including nerve injury in the jaw that can temporarily cause an uneven smile or facial muscle weakness (experienced by 4 out of 100 people in clinical studies) and trouble swallowing (experienced by 2 out of 100 people in clinical studies). The most common side effects in the treatment area include: Side effects are usually temporary and often resolve on their own.